For many visitors to New Orleans (or any city, really), the first thing that comes to mind when choosing which neighborhood to stay in is safety. When it comes to The Big Easy, though, the crime rates are relatively high, so you should pay special attention where you're booking your accommodations when you're planning your trip to Louisiana's most popular tourist destination. The Big Easy has seen more than 100 murders annually since 1966, and although that figure has dropped from its mid-1990s high of more than 400 per year, New Orleans still has one of the highest murder rates in the country. Like other heavily populated cities, most violent crimes in New Orleans take place far from neighborhoods where tourists traditionally visit and, by correlation, where most hotels, rental properties, bed and breakfasts, and AirBnBs are located. Fortunately, there are several neighborhoods and locations within New Orleans where you can stay where you know you'll be relatively safe. However, you should also be sure to follow safety guidelines—which also apply in most major cities around the world—if you're traveling alone. The Garden District and Uptown are the safest areas of the city with the lowest crime rates (under two percent). While a little more scarcely populated, these neighborhoods are great destinations if you're looking to stay among historical buildings and tree-lined boulevards. With wide streets lined with elegant two-story homes surrounded by wrought-iron fences, the Garden District—especially the Audubon neighborhood of the district—offers a variety of accommodations whose upscale elegance and old-world charm make it feel like you're not even in the city anymore. Meanwhile, Uptown offers some luxury-style accommodations and a few more attractions to visit on your trip. The downside to these neighboring districts is that there aren't many restaurants or entertainment options nearby (with the possible exception of Commander's Palace), and you'll find yourself often traveling into other neighborhoods at night anyway in search of things to do, meaning you'll still be exposed to the dangers of higher crime rates and population densities elsewhere in New Orleans. As the nickname suggests, the city's Central Business District is home to many of the city's most well-known establishments, including hotels and tourist attractions. Like Times Square in New York City, many first-time travelers will stay in this district, leading to an increased police presence to help mitigate the possibility of crime. However, there are stretches of the neighborhood that can be a bit unsafe at night; if you choose to stay here, hotels closer to Canal Street are generally safer. It's worth checking out the revived Oretha Castle Haley (OCH) Boulevard section closer to Central City, but make sure to stay on the same side of OCH Boulevard as the river after dark. Attractions in the Central Business District include The National World War II Museum, the Louisiana Children's Museum, and Lafayette Square; accommodations include the Hilton Riverside and the Blake Hotel New Orleans. 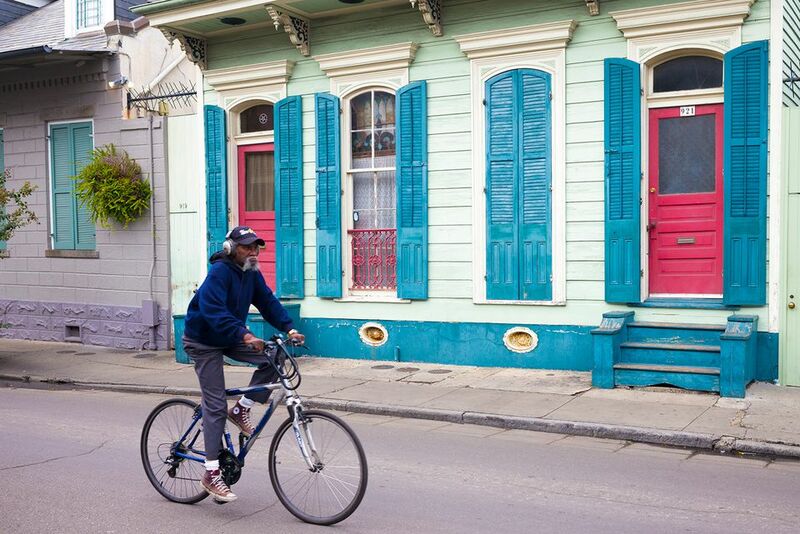 The best bet for a low crime area is the city's busiest district: the French Quarter. Here, you're the least likely to see violent crimes, particularly in the heavily-trafficked blocks from Bourbon Street to Decatur Street and from Canal Street to Ann Street. The popularity of this stretch means, however, that it can be a magnet for pickpockets and low-grade scammers, but the volume of people means that violent crime against visitors is very uncommon. Also, the neighborhood is packed with restaurants, so the need to travel to other neighborhoods at night is diminished, but accommodations here are more expensive and more likely to book up fast during the high season. In the French Quarter, you can start the day with stopping by the historic Laulaurie Mansion or the New Orleans Voodoo Museum before grabbing a bite at The Court of Two Sisters, Tujague's, or Cafe Du Monde. For accommodations, you can stay overnight at the Bourbon, the Four Points by Sheraton, Hotel Le Marais, or the Chateau LeMoyne French Quarter. Overall, most hotels in New Orleans are in areas that are quite safe for tourists to visit and travel between, with the exception being those on Chef Menteur Highway, which are largely safe to stay in but further out from the city's biggest attractions. However, folks who aren't simply stopping through should consider staying in one of the other neighborhoods, as they are simply safer overall, and you're more likely to be able to find a police officer or some other official who can point you in the right direction if you get lost. If you're looking at an Airbnb, VRBO, or another unofficial short-term rental, you can use the crime maps provided by the New Orleans Police Department, as well as the review functions on your rental website, to get a sense of the immediate neighborhood. It's worth reiterating, however, that less-experienced travelers, newbies to New Orleans, and those who aren't familiar with staying safe in an unfamiliar place should consider the neighborhoods above. Although there are relatively few incidents of violent crimes occurring in the safer neighborhoods of New Orleans, many of the city's busiest districts can be dangerous for first-time visitors in other ways. Two of the primary things tourists should look out for in the French Quarter, Garden District, and Central City are pickpockets, scammers, and petty thieves. When wandering around the busy neighborhoods—especially at night, during a festive event like Mardi Gras, or by yourself—make sure you remain aware of your valuables at all times. Purse snatchers are more common along Bourbon Street in the French Quarter and around the city's biggest attractions (where tourists are often distracted). If you plan to go out at night, keep to well-lit areas and try to only travel with a friend (or group of friends). While public transit is relatively safe, you can also use popular apps like Uber and Lyft to call a car service around town (or hop in a city cab). However, you should avoid walking alone at night, especially in non-residential areas and those with higher crime rates. Although New Orleans is a driving-friendly city—especially when it comes to parking and traffic flow—the roads can be rather dangerous in terms of potholes, collisions, and break-ins. When parking (even in a garage), make sure you don't leave any valuables out in your vehicle, especially if your car does not have an alarm system.